This entry was posted on April 15, 2014 by Jessica Anderson. Your grown child has moved out of the house, and you’re reclaiming his/her room as your own. What do you do with that collection of old, dusty trophies? Here are some ideas of how to give those old trophies a new life. 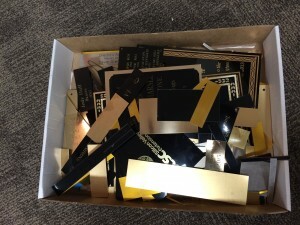 Our engraver Mike's box of brass scraps bound for recycling. Unfortunately, the awards and recognition industry does not produce many recyclable trophy components. Most of the trophies we create cannot be recycled and must be either reused or disposed. Hopefully our industry will soon change its ways and reduce waste by offering recyclable products or products made from recycled materials. Until then, we have some suggestions for more utility from your old awards. Most metal plates that are attached to plaques and trophies can be recycled. Usually these plates are made from aluminum or brass and can be taken to a local recycling center. We recycle all of our scrap metal from plates. 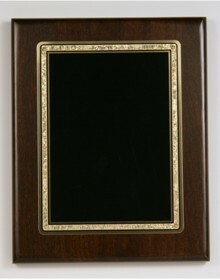 Many solid wood plaques are biodegradable. Our Eco-Plaques and Bamboo Plaques are harvested from environmentally-friendly sustainable forests. These are a great product choice for eco conscious buyers. This eco-plaque is made of sustainably harvested cherry and the engraved metal plate can be recycled. Many larger chain thrift stores, such as Goodwill or Value Village, accept donations of gently used awards in good condition. They clean and sell the old trophies to their customers. It’s surprising what creative things people can make out of old awards! Unfortunately, many smaller thrift stores do not accept trophies. If you have a question, call your local second-hand store before making your donation. If you decide to reuse trophies for another season, the old engraved metal can be removed and recycled. New metal plates can be ordered and easily attached to existing trophies using double sided tape. If your team is concerned about purchasing products that cannot be recycled, consider making your own awards out of wood or another biodegradable material. At Trophies2Go, engraved plates are available for you to attach to your awards. All of our engraved metal is recyclable. We appreciate and share your commitment to our environment. At Trophies2Go.com, we strive to create meaningful recognition in an earth-friendly way!